When I was a teenager, growing up in a house full of boys, I was obsessed with wonder woman – but in fairness, there weren’t that many other female superheroes for a young girl to choose from. I’ve always loved superheroes and YA fiction, but it wasn’t until I was expecting our first son (and so got to take a really long time off work) that I decided I wanted to create my own superhero, one that didn’t fit in to the usual ‘female-superhero moulds’ like Wonder Woman or Cat Woman. The lead character in Chopstix, Wendy Wu, is a Chinese girl that has grown up in the west. In my free time (when I wasn’t feeding or changing or just generally getting to grips with our new baby! ), I started to jot down a few ideas and then, when I built up the confidence, I shared these with my friends and family, and to my amazement, rather than laugh, they encouraged me to develop the ideas further and see where my creativity would take me. I would sit for hours at my computer tapping away, writing draft after draft; it was a long time until I actually had the first tangible chapter of Chopstix. Part of the reason it took me so long was because I wanted to create a whole-new fantastic world and a brand-new story full of unique characters, hidden magic, which is no small task, but most of all I really wanted the plot to capture the essence of true human feelings, and evoke my reader’s emotions. I also am a firm believer that literature can empower people, whether young or old, and YA literature has a great potential to do this. So with the book, from the very beginning I wanted it to incorporate sensitive issues that readers could connect with, like bullying and loss which both play big parts in the narrative of the story, for example when I wanted to inspire readers to be true to themselves in a fun way, and also be kind to others. 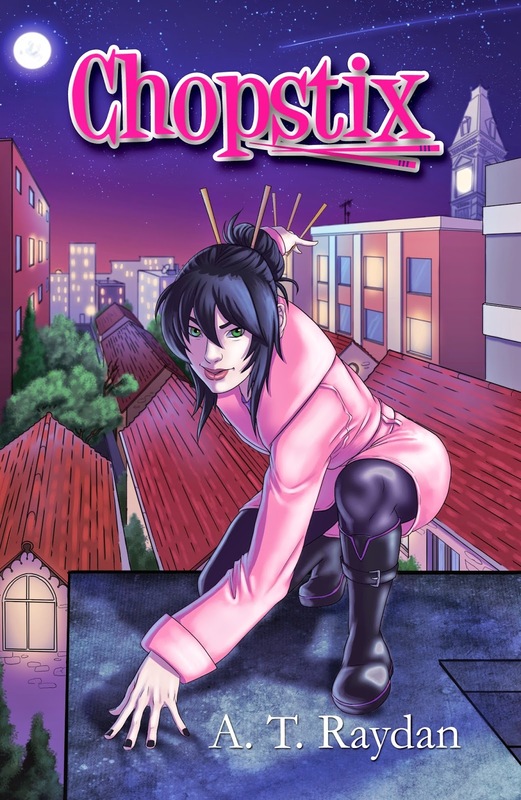 And so with all this in mind Chopstix was born, A superhero born in New Valliant City, as simple Wendy Wu, who loses her parents in a heart-breaking fire and discovers a world of myth and magic that she has been ancestrally bound to from birth. NEXT STOP: Check out SuddenlyLorna as she kicks off the Chopstix Challenge over on Youtube! YESTERDAY’S STOP: See Pretty Little Memoirs’ Q+A with YA superhero Chopstix!